I enjoy keeping track of the costs of my lifestyle, especially since it’s so different than a conventional lifestyle. It’s interesting for me to compare my current costs to what they used to be when I lived in one place and just took the occasional trip, and it’s honestly pretty amazing to me that a lot of my costs really aren’t that different. I actually spent less on lodging in 2018 than I would have living at my old place in Ann Arbor, MI! I kept track of all of my personal expenses for the whole year, and I want to share them. I’m not going to break them down by country or month or anything like that, but I will add some commentary about whether I think expenses were high or low or about average. Please note that this article does not include any of my business expenses. Some of my flights and hotel nights are business expenses, as is the occasional meal or activity. At some point, I’d like to turn that into a separate post, but it’s probably not going to happen this year. That works out to total personal spending of $33,016.60. My lodging expenses I’m overall very happy with. I used to spend $1,000 per month on my apartment in Ann Arbor, so the fact that I’m able to spend about half of that while traveling is pretty amazing to me. I didn’t keep track of how many nights I stayed in different types of accommodation in 2018 (but I’m starting that again for 2019), though I can tell you I spent a lot of nights in Airbnbs. I also spent probably a cumulative two months at my parent’s house, my boyfriend’s parent’s house, and friends’ houses, so there’s a fair bit of savings that comes from not actually having to pay for lodging all year. Yeah, I spend kind of a lot of money on food. I like to cook, but sometimes eating out is more feasible, and I do also like fine dining. Every year I try to visit at least one or two Michelin-starred restaurants and I also really enjoy other somewhat expensive foods like sushi. I would love to see my food bill go down in 2019, but realistically, good food is a really important part of my life and I just don’t know if it’s going to happen. I would probably rather make cuts elsewhere. I was honestly pretty surprised by how much money I spent on “shopping” expenses, because I don’t usually consider myself a big shopper. That said, this category includes any gifts I bought over the course of the year and books on Amazon. I do read quite a bit and the cost of books definitely adds up (as of Feb 2019 I have access to my library’s Kindle books so hopefully this expense will go down). I also do really enjoy giving good gifts to my friends and family, and sometimes I probably get a little carried away. I don’t really expect that to change, or really even want it to, because it’s so fun for me to find great things while I’m traveling that I know someone in my life will love. Activities and sightseeing are pretty similar categories to me, and the way I usually split things up was that if I was doing something – i.e. white water rafting – it was an activity while if I was seeing something – like visiting a museum – it was sightseeing. I could probably track these two categories together next year since I’m combining them here. I actually think this is a pretty low activity expense for the year because I felt like I did a great number of activities last year! I did go white water rafting, to a few museums, did a bunch of climbing – both indoors and outdoors, went paragliding, went scuba diving, and probably a ton more that I’m forgetting about. Granted, some activity expenses are business expenses for me, but only the ones I write about! Well, I like beer. And usually expensive beer. I’m taking sours, Belgians, and generally kind of funky craft beers. I don’t really even blink an eye about spending $20 on a bottle of beer anymore (except when I’m thinking about it now!). That said, in a lot of the places I travel, there’s not a lot of good beer (hello three weeks in Russia in 2018!). And when there’s not good beer, I don’t usually drink much. Any water, juices, and other drinks I bought over the course of the year are also included in this category, but I don’t really drink a lot of those things and I also always travel with my water filter so I don’t have to pay for water. I do drink coffee too. The occasional drink expense ends up in the food category because if everything is on one bill I don’ take the time to split it out, so the food expenses section is definitely a little inflated with a few drinks as part of meals. My transportation expenses are amazingly low considering how much traveling I do! Not owning a car definitely helps but using points and miles to cover my flight costs probably helps more. I also do have a few flights that count as business expenses, and as mentioned already, those are not included in this number. I should also keep track of how many points and miles I use in a year so I can share those numbers with you! So it’s a pretty big variety of things. I tried to list things in order from approximate most spending to approximate least spending, but I don’t have the exact actual numbers to back that up anymore. Definitely, my student loan payments are one of my biggest monthly expenses. It’s going to be a while before I have them paid off but I am chugging away at them! Overall, I think my spending is pretty reasonable, and I’m impressed with how much I am able to travel for $33K and change. If I wasn’t semi-nomadic, I’m sure some of my expenses would be lower, but some would likely be higher (I’m looking at you, beer!). 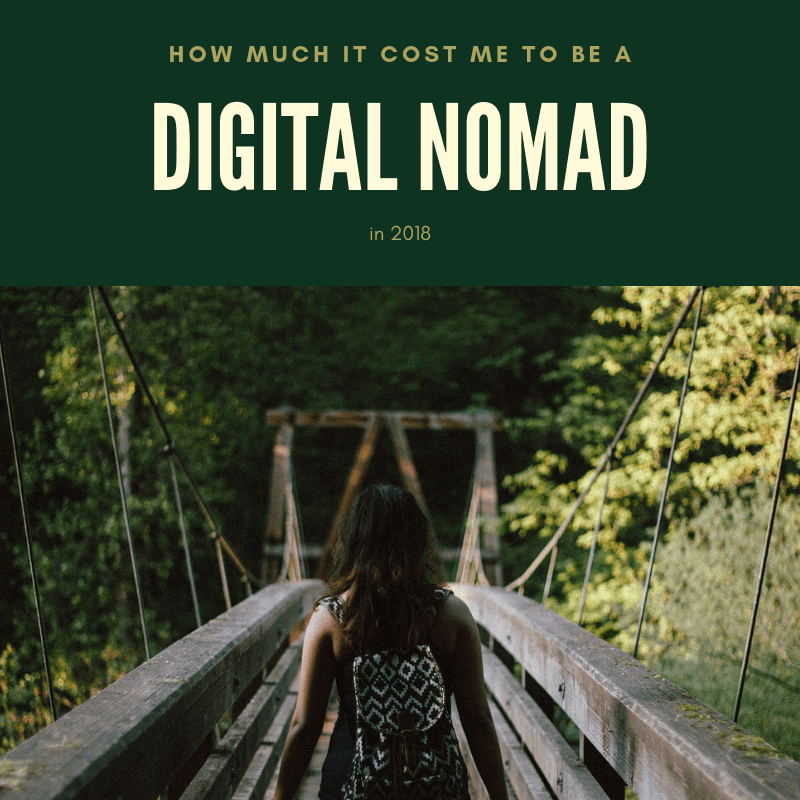 I’m curious to know how this compares to your yearly spending – whether you live in one place, travel for work, or are nomadic like I am! Let me know your questions and thoughts in the comments. Well this is the first accounting that I have read about you ” travel nomads” so thanks for this summary. I have always been a bit curious as to the expenses of someone in your profession who is able to travel the world. Now here is the part where you can tell me it’s none of my business! Do you make enough with your writings, blogs and whatever sources of income you have while on the road to cover these expenses? You sure don’t need student loan part two when you are done seeing the world! Thanks again for this insight. Hoping to continue this and improve it each year! Glad you enjoyed.